Nothing is more seductive than a sensual bottle of Gucci Sport Pour Homme EDT 50ml . The easy-to-wear, casual fragrance features crisp, citrus aspects that channel the energy of active, outdoor moments. Top notes of mandarin, grapefruit, and cypress create a burst of freshness. A heart of cardamom, juniper berries, and fig offers a bright, aromatic twist. Woody base notes of patchouli, vetyver, and ambrette seeds underline the essence with naturally magnetic appeal. 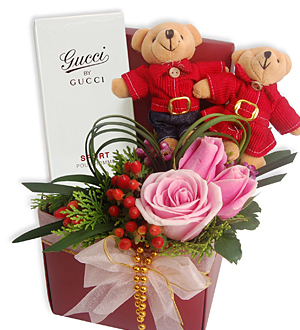 This luxurious fragrant gift comes with two cutesy couple bears presented in a box of romantic Roses.